Well, things are going well with the new build of Excelsior Station. Though I have to admit that I still get a little surprised at the size of the place whenever I travel to different parts to work on things. And there are a couple of issues with travelling. Teleporting, in fact, but only when using the command line function that many viewers now have. The command line function is where you can type a short command, such as gtp x y z to teleport to a specific point without looking for a LandMark. 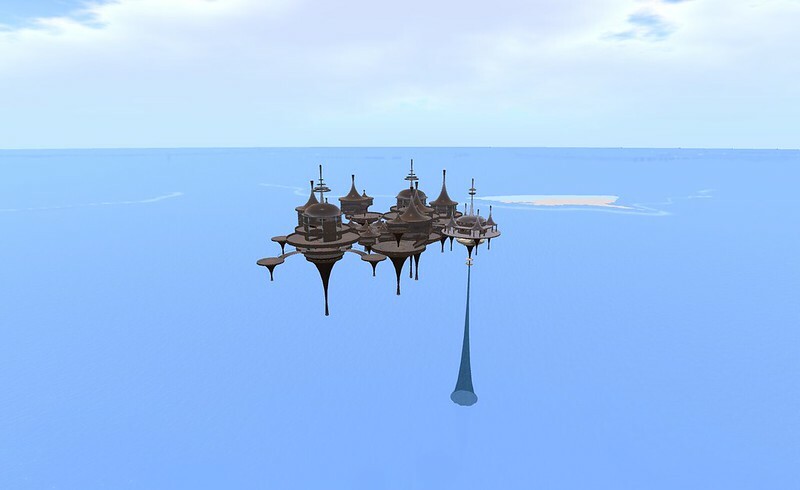 I’m pretty sure its due to the 4096 limit that has used to plague SL and OpenSim, and still does when using HyperGrid. But, in AuroraSim, I’ve had no issue with it when using LandMarks. I haven’t tried any teleport devices yet. I simply haven’t got around to building any, though. First is the default Landing Zone. Nothing there yet except for the main platform. I just don’t know what I want to place there. There will be structures for freebies, though the freebies themselves will come from future residents. And I will be importing a number of Linda Kellie’s things into the Inventory Library, which I’ve renamed to WareHouse. Here’s something I call The First Prim. This is something my late friend, Ravin, used to do. 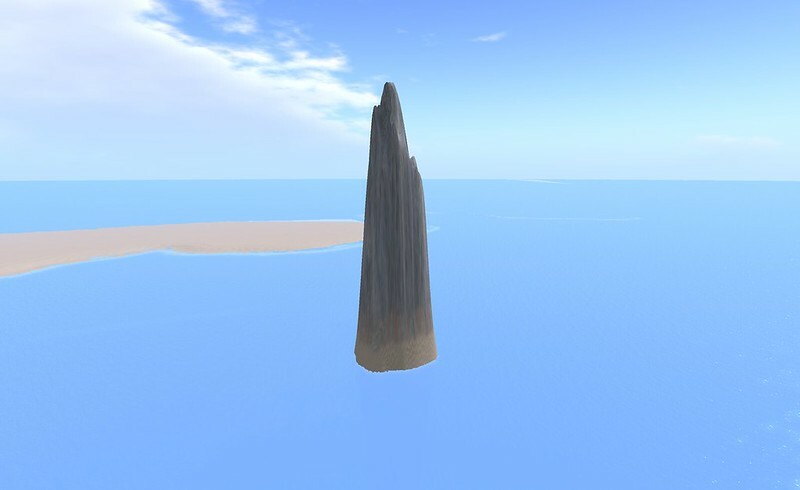 Its the very first prim that I rezzed inworld. And it has a secret. 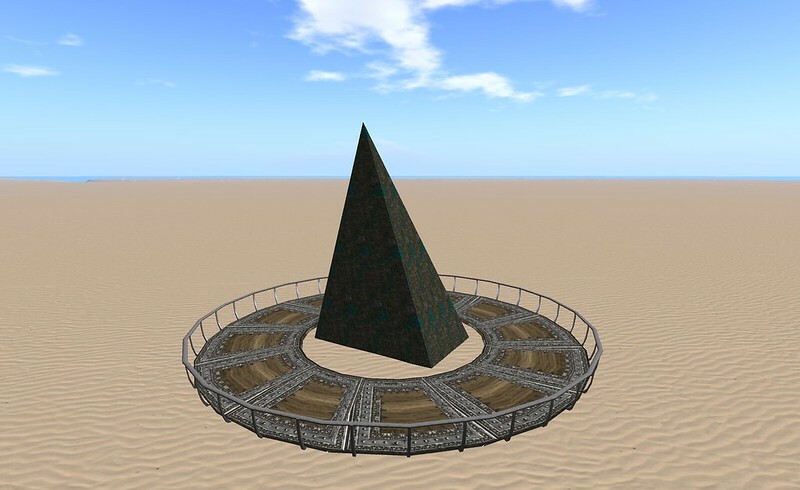 I don’t know what the prize will be, but that unknown prize will go to the first person who solves The Secret of The First Prim. The platform and railing is simply to keep bystanders from coming into contact with it. So far, the scientists haven’t found anything harmful about it, but you can’t be too careful. What self-respecting RP world doesn’t have Fangs? You’ve likely noticed that there’s no grass anywhere. 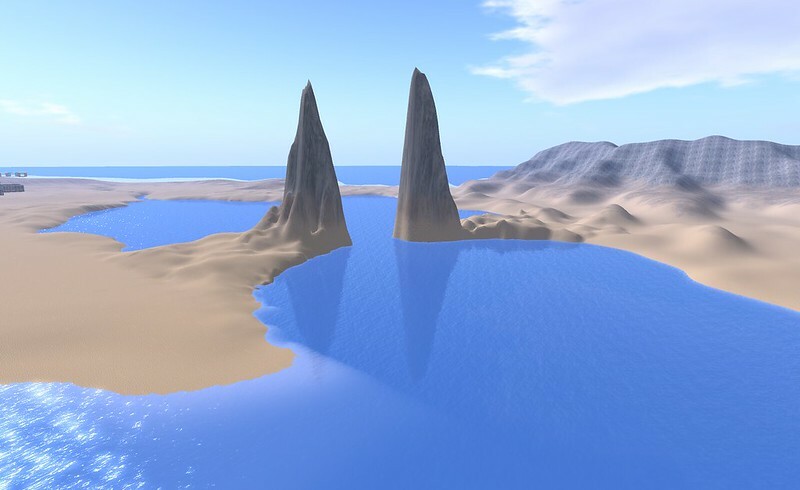 I’m experimenting with the idea of an all sand and sea world. 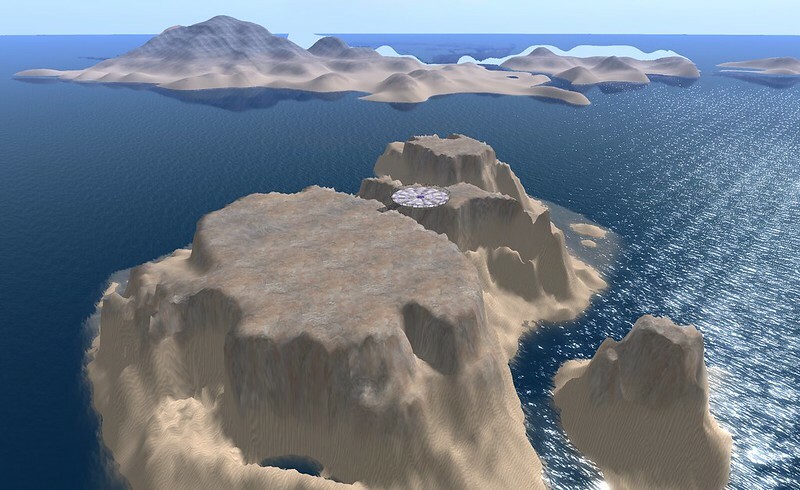 I’ve also found that it helps with terraforming as shadows show much more clearly. Its easier to find potholes and land spikes that make things look unnatural. Just for the fun of it, the Devil’s Sceptre. I was looking for pictures and layouts for starports when I came across a build that used a rock spire as the foundation to “hang” everything off of. I’m thinking this would make a good military style outpost. And I’m not really happy with the name, so that will be another little contest to run. Here’s the one build I imported from the old Station. I call this Skyville, but, again, I’m not happy with the name. So, another contest. I still have no idea of what sort of prize to give, but I’ll think of something. Perhaps a permanently free region sized parcel? Would that be a good prize for the naming contests? Well, that’s it for now. I’m definitely taking it slow, trying to keep within my health limits. I am having fun, though, and that’s one of the best remedies there is.